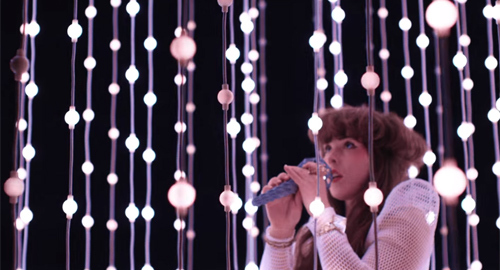 In a bid to outdo Jean Michel-Jarre, Canadian dream-pop duo Purity Ring have used 2,500 LED lights as the backdrop for their new video. That's enough to illuminate 50 Christmas Trees, or one of Madonna's vanity mirrors. The clip finds singer Megan James falling through a black void, until she lands in a surreal, sci-fi showroom - filled with hanging lightbulbs, glowing screens and dancing men in squid pyjamas. The video consists of the many elements we have created and chosen to express in a live context, but has an added sightline of being in another world, keeping the past in arms with the present and holding a bit of magic in the dark. I don't know what that means, but it all looks very pretty.